Last Outpost | Irene Abdou Photography, LLC - Travel. Lifestyle. Documentary. NGOs, Development & Public Health. 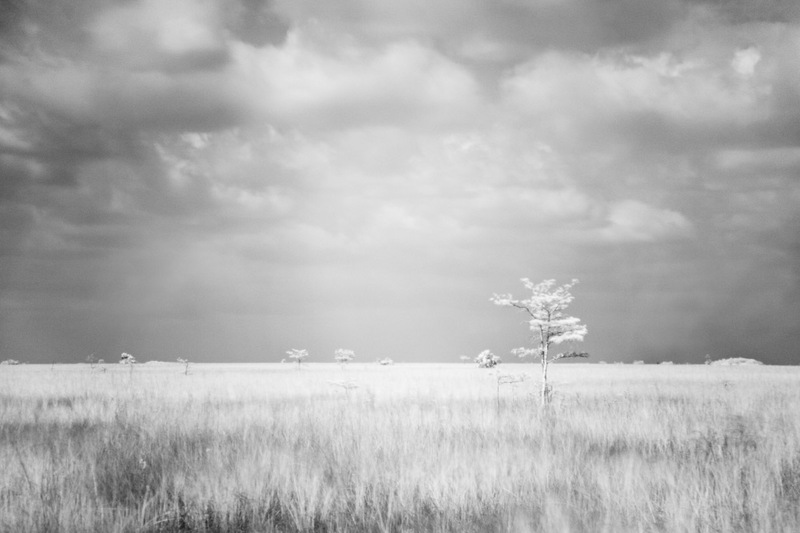 In this infrared photograph, at Pa-hay-okee Overlook, visitors see a never-ending stretch of flat land with an occasional tree. Pa-hay okee Overlook lies nearly halfway between the Everglades National Park's Ernest F. Coe and Flamingo Visitor Centers. This image is part of my "Alternative Reality" series. All cameras have an internal filter that blocks most, if not all, infrared light from passing through it. Because the infrared blocking filter in my camera still allows a very small amount of infrared light to trickle through, I am able to do infrared photography by placing a filter on my camera lens that blocks all visible light. Thus, the camera can still make use of the trickle of infrared allowed through. Because so little light enters the camera, I use a tripod and set very long exposures, up to 10 minutes in length. The advantage of working this way is that the long exposures allow me to creatively capture the movement of my subjects such as trees and grass blowing in the wind. I love the resulting effect, as well as the alternative reality of infrared.